Supasit Puttikaew (left) and Nanchaphon Laptanachai in their new restaurant. That’s Puttikaew’s nod to Hawker Fare, James Syhabout’s seminal restaurant that introduced many to the beloved dish. Puttikaew was most recently chef de cuisine at Hawker Fare in San Francisco — he spent more than four years working for Syhabout, first with a stage at Commis and then at the now-closed Box & Bells. 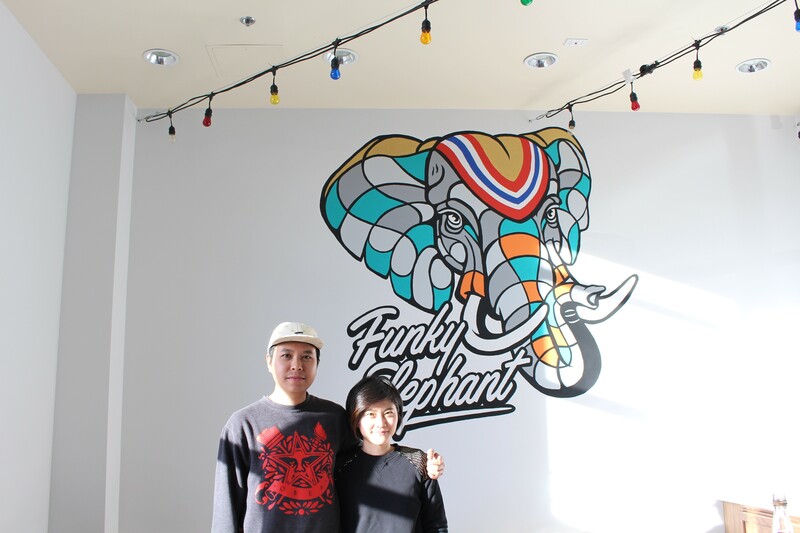 Now, Puttikaew has struck out on his own — along with Laptanachai — with Funky Elephant (1313 Ninth St., Ste. 120), set to debut Friday, Jan. 5, in Berkeley’s Gilman district. After that, it will be open for lunch and dinner Tuesday through Sunday. Funky Elephant occupies a tiny space — it used to be Doughnut Dolly — and will likely depend heavily on take-out and delivery orders. But there are a handful of tables inside, plus several more on a patio shared with Philz Coffee. That means there’s house-made Isaan-style pork sausage stuffed with rice, garlic, and peppercorns and grilled to order ($13); as well as Bangkok-specific versions of dishes, such as Funky Elephant’s green papaya salad with cherry tomatoes, snake beans, and dried shrimp ($11). Puttikaew expects the khao mun ghai ($13) to be a signature dish, and he does prepare it differently than Hawker Fare. Instead of chicken thighs, he uses breasts. The rice features more ginger, and so does the sauce, which is spicier, too. Puttikaew is also excited about his pad Thai ($13), which in Bangkok style features shallots and meaty white shrimp. He proudly makes the tamarind water using fresh tamarind pods — a step he suspects a lot of Bay Area Thai restaurants don’t take, opting for vinegar and frozen ingredients instead. “We don’t want to cheat,” he said. That’s pretty much Funky Elephant’s whole ethos — using quality ingredients and making everything from scratch in a casual, counter-service setting. hanger steak in green curry. To drink, there’s a mix of local and imported teas and sodas, and beer and wine are still to come. Finish up with organic Strauss soft serve — the flavor will change every few weeks, but it’s Thai tea to start. Laptanachai is still experimenting with boba tea drinks, and in the future, Puttikaew might play with weekend specials or Asian-style brunch along the lines of Thai rice porridge and kaya toast.